My first full day in Cornwall started well. While clouds still loured, there was a fair amount of blue in the skies, and the seas were much calmer than on the first. I ate a hearty breakfast downstairs in the pub: egg, sausage, bacon, tomato, beans and interestingly very fresh mushrooms sautéed nicely. My usual experience with mushrooms at English breakfasts was canned and slightly heated. Not appetizing. Nor frankly were even the best of mushrooms at early morning. But I filled up and after wrote on the blog, then headed the short distance to the rail station where my day of adventure began. Russ was my guide, a bright young man with a good sense of humor and gift of gab, who was filled with knowledge of the countryside. He had planned a full itinerary but happily accommodated me as well. I was his sole passenger and as agreed for this privilege I paid £60. This may seem like a hefty price but in terms of value for dollar I was more than satisfied. We started out into open countryside, and even before we were completely away from Penzance Russ spotted two peacocks on the side of the road. “A good sign” he acknowledged, and who was I to deny that? 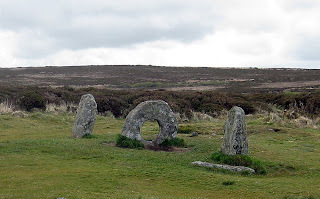 We headed over rough moors to the north side of West Cornwall, only about six miles from the south side on which Penzance is situated, on tiny roads that, as had been the case in my highlands trip, forced drivers to give way as no two cars could squeeze by one another. 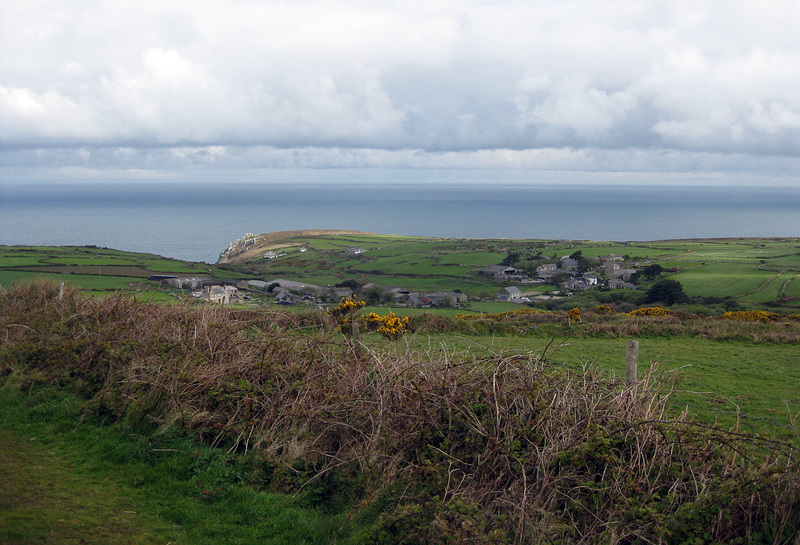 We stopped a little distance from the tiny village of Zennor, consisting of, Russ estimated, about 50 souls. From out vantage point we could see the few buildings surrounded by some fields but mostly moors, the Penwith Moors in fact, and the sea beyond. Beautiful! He took me through the village, pointing out a tiny museum that featured a tiny working mill, and a popular pub, the Tinners Arms, built in 1271 (!) to accommodate the masons who built the village church, St Senara’s. a lovely but prickly plant! 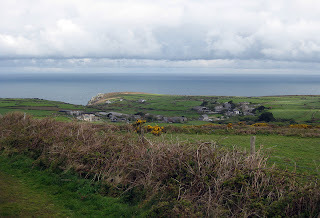 I had a look at the internet and found a description of the village: "At Zennor one sees infinite Atlantic, all peacock-mingled colours, and the gorse is sunshine itself. 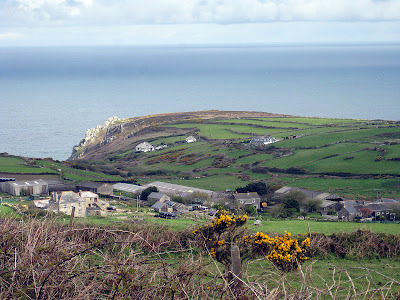 Zennor is a most beautiful place: a tiny granite village nestling under high shaggy moor-hills and a big sweep of lovely sea beyond, such a lovely sea, lovelier even than the Mediterranean... It is the best place I have been in, I think." D.H Lawrence wrote the words in 1916. He lived in the area for a time during World War I, but he was a stranger, and he also had a German girlfriend. Suspicious that the pair might actually be spying or in other ways aiding the German army, perhaps by signaling to them at sea, a crowd gathered and not at all kindly suggested to Lawrence that he leave and never come back. He wisely obeyed and never did return, but found time later to write several very unkind words about the area he so sweetly characterized in the quote above. which had been vital to the economy of the area from as far back as the bronze age, providing England with most of its tin and copper until discoveries of other areas in the world that yielded the same ore nearer the surface – Russ told me that the mines could be as deep as one kilometer, and that is search of the valuable products miners tunneled out under the seabed! – rendered them increasingly obsolete. Today Cornwall has one of the highest unemployment rates in the U.K., and all of its mines are closed. 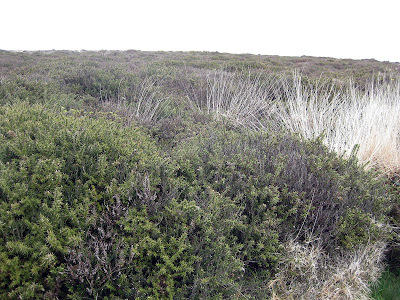 Agriculture is now the number one industry, in a land somewhat hostile to it, filled with moors where beautiful looking but fast-growing gorse (see the close-up photo of Zennor above), filled with sharp thorns (I felt them myself), heather and braken cover the earth. Tourism is a close number two. Also close by Zennor, heading south, we stopped at what looked to be the middle of a moor with nothing around it. “I’ll test your walking skills now,” said Russ, to whom I had just been saying that I could walk long distances on a flat but was no good at hills. Luckily for me we were in a flat section of the moors, but the path was soggy and muddy from recent rains. Still, I managed it the walk rather well. We hiked for a good ten minutes when we came across the next object Russ wanted to show me: Men-an-Tol, which in Cornish means “hole stone” and which the locals call the crick stone, is considered to be from the Bronze age, and is the subject of much debate as to its usage. According to legend, piskies guard it, and at one point a changeling child had to be passed through the hole in order to get the real child, which had been stolen by the piskies, returned to its mother. It’s said to have healing powers, namely as a cure for rickets, lower back problems, etc. It has also been suggested that the stone was the entrance to a burial site. Other similar stones have been found in the area, but none so large as to be able to pass a child, or adult through, as this one is. Perhaps I should have myself sent through to help my own lower back! Dottore Gianni Ponders: "Can I fit through that hole?" 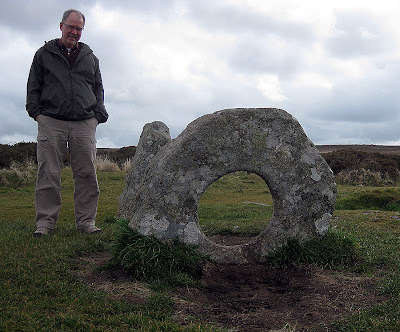 A reminder that Men-an-tol is older than Stonehenge, older than the pyramids, of a similar date as Skara Brae in the Orkneys. 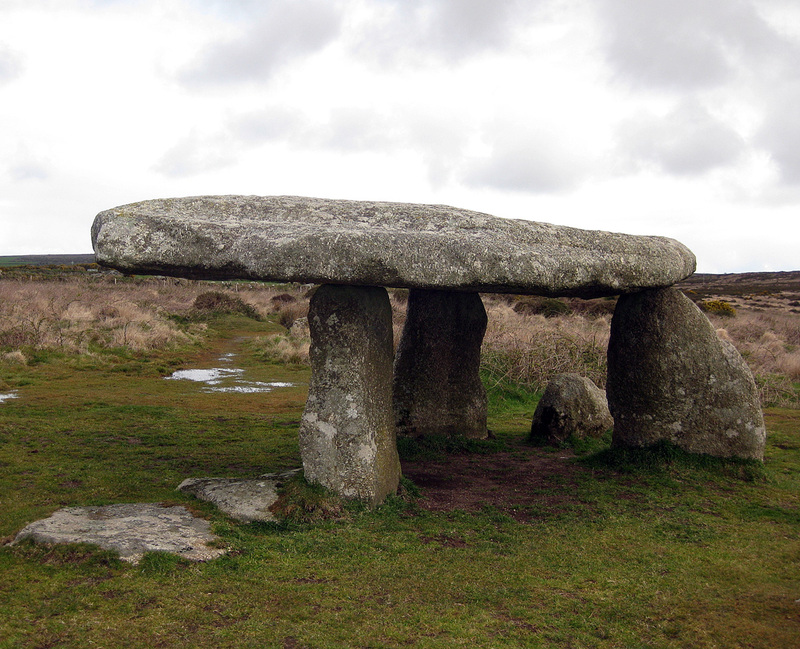 On next we went to another ancient site not far afield – Lanyon Quoit, 2500 years old, and assumed to be a burial site. It was originally higher, enough so that a man on a horse could pass under it, but the ravates of time took their effect, up to the early nineteenth century when harsh storms caused one of its legs to break and it was re-positioned. But this site is only one of several sites throughout West Cornwall that remind us how far back the area was peopled, and how important religious rites, to worship, appease, or for whatever purposes, but in most cases allied to burials, were to these early cultures. 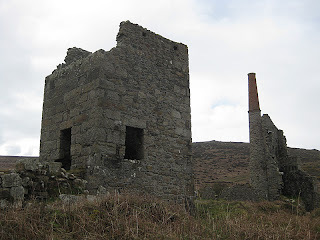 In the distance across the moors from Lanyon Quoit stands another castle-like structure, the Greensborough mining engine house – structures left to us from thousands of years or merely hundreds, dot this fascinating landscape. 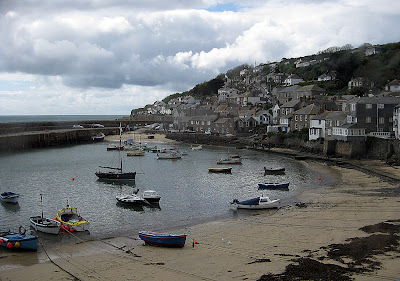 We headed back to the south coast, passing through the picturesque village of Mousehole (pronounced MOW-zel, vs MOUSE-hole, though it’s tiny enough for that connotation), then a bit back inland to a wonderful little craft shop/coffee and cake café whose name I forget. It’s a shame, because there I consumed the most wonderful “crumble” I can remember! 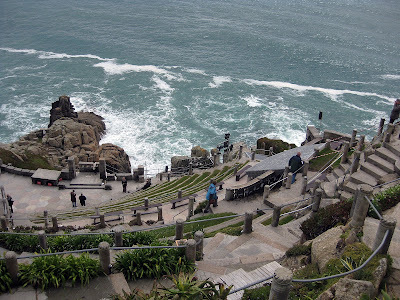 Then on to one of the most breathtaking spots on the coast, and this one really is right up there for scattering my ashes to the wind, along with the Isle of Skye and Portovenere, Porthcurno Beach. I’m not sure I have words to describe this one, so I’ll just let a photo do it for me! an outdoor theatre in something like the ancient Greek outdoor theatre, with a little of the Elizabethan public theatres as well. The theatre was founded in the 1930s by a feisty woman named Rowena Cade, who through sheer force of will created and kept improving this amazing structure. When World War II turned the place into a barbed wire nightmare to protect against German invasion, Rowena snuck under the wire with her greaa mower to keep the area looking trim. And when the war ended she resurrected and improved it. My only concern is that the quality of the play being presented had better be good, as the natural surroundings are so beautiful it would be very easy to lose focus! 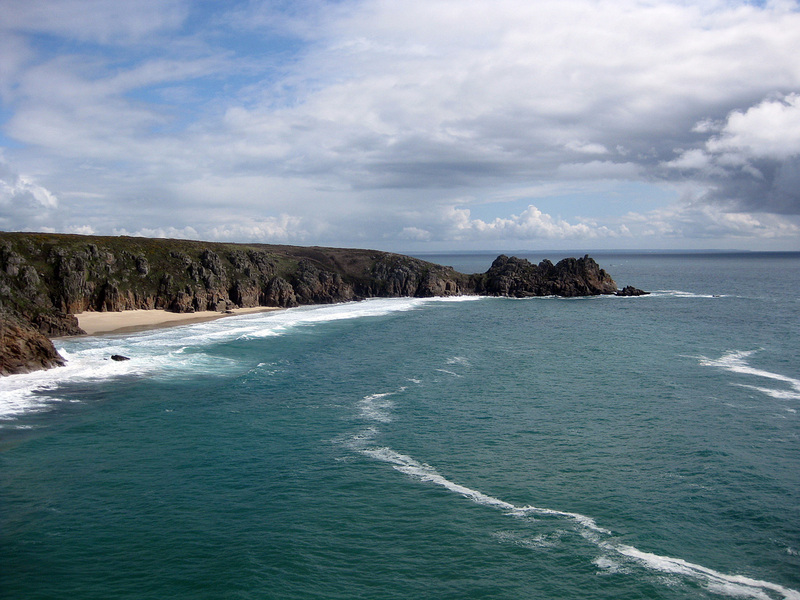 From the sublime Porthcurno Russ, under pressure from me, drove me to the ridiculous Land’s End, a lovely spot in itself in a rugged way, facing the Atlantic. 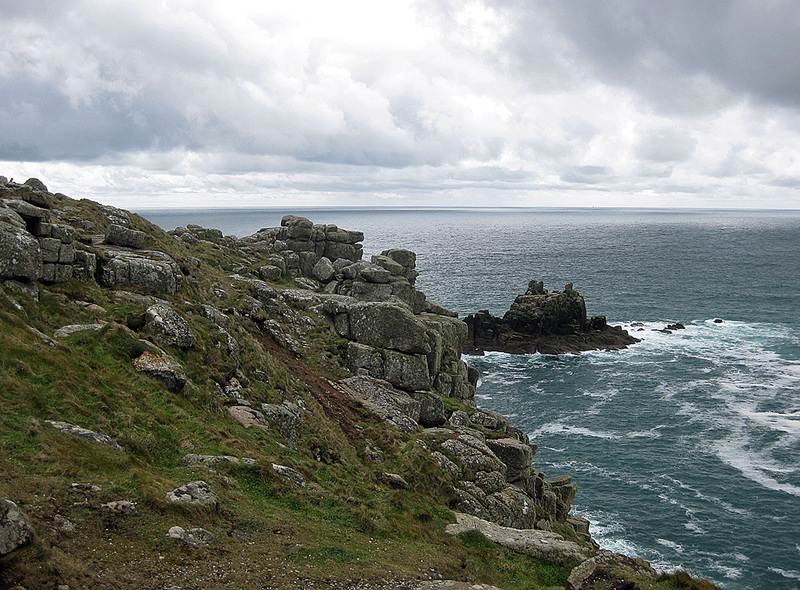 If you set out from here and passed the Isles of Scilly, the next stop would be Newfoundland. But in the way of the natural rugged beauty is a ridiculous group of buildings that sell just about anything you can imagine, bill themselves as fun for the whole family, and pretty much sell the place down the river. Russ was right, but I did want one look out at the Atlantic to remind myself that in a very short time, less than two weeks now, I’ll be flying back across the pond, like it or not! A quick dash back to Penzance and that was the end of the tour. It was really wonderful. 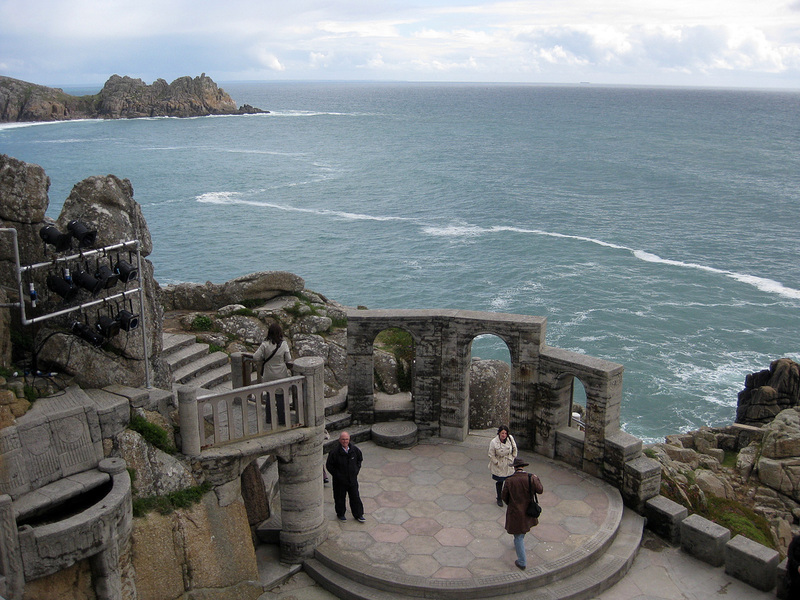 I saw so much in four hours, and know much more about West Cornwall. I began by thinking this would be my one and only time to visit, but I am re-thinking now. 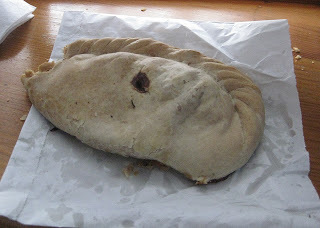 the best possible traditional Cornish pasty in Penzance, but the drizzle started as soon as I left the pasty shop (Lavendar’s, in case you’re ever in Penzance) so I raced back to my room and after wolfing down the pasty I worked on photos and blog. By the way I don’t think I’ll ever really enjoy this staple food of the southwest of the U.K. It is greasy, messy, takes forever to get to the meat of it. Even the best of pasties is not to Dottore Gianni’s taste-y. There is little to say about the rest of my day. The weather improved briefly and I tool a brief walk in it, but it turned wet enough again that I opted against the highly recommended Turk’s Head, as I’d have got soaked just getting to it, and had a mediocre burger at my inn/pub. I also really wanted to try Tribute, a very popular local ale, but though there were two taps of it at the Longboat, both were empty, so I settled for another Doombar. Back up to my room, more work on the blog, and that’s about all I have to say about Penzance! 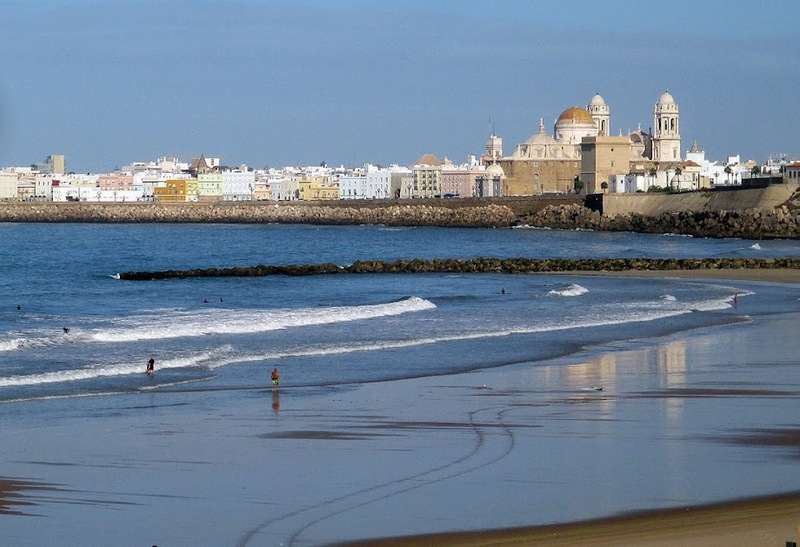 A good time, in a nice enough seaside town, with a fabulous four hours out and about on my tour, but the weather kept me from enjoying it as much as I might have. But St Ives is amazing! That’s to throw some suspense your way, as I am nearing the end of my first day in that city, but not quite ready to write about it yet! Maybe tomorrow morning! For now, be content with this narrative, and probably more interesting, the photos that accompany it!